I’ve listened to the Audible version of this book twice – once on my own, and again after recommending it to members of my family as we drove across country. Both times I found it to be really a wonderful, magical book that entertains and encourages curiosity. Ceony Twill has finished her studies at magician’s school and must now work an internship. Normally students would be given the opportunity to choose what sort of magic they would like to focus on, but Ceony is assigned to study paper – which would certainly never have made her list of magic to study. 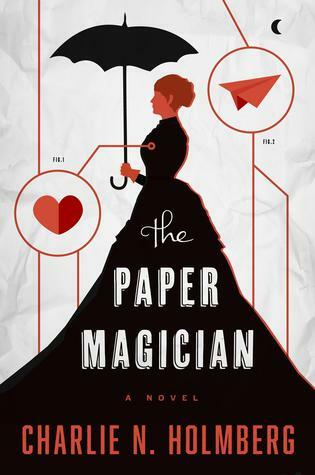 She arrives at Paper Magician Emery Thane’s home and through a long series of adventures and events, comes to have a new appreciation for the art of magic paper manipulation. She also develops a school-girl crush on Thane – a young magician. But Thane is – or was – married and his wife now associates with an Excisioner – a dark art that manipulates human flesh. She attacks Thane, ripping out his heart, and Ceony devotes her limited skills to saving and protecting him. What looked like a boring time, folding paper, turns out to be a wild, dangerous adventure. Author Charlie N. Holmberg (whom I have called “one of the freshest voices in fantasy“) is clearly writing in a world post-Harry Potter and does a nice job of picking up the torch and carrying on with tales of student magicians. Though Holmberg takes a track and her book is definitely targeted toward a female YA audience, my sci-fi-and-horror-reading teenage son enjoyed the audible book as well. This speaks highly to the development of the characters – making them appealing no matter gender or age the listener – and to the excitement of the story. The magic feels real and Holmberg puts just the right amount of emphasis on what it takes to complete the sort of magic she is describing. It is easy to see why this book is so appealing. The Audible book, narrated by Amy McFadden, is well done. McFadden helps to bring the story to life and it is easy to imagine her voice as Ceony Twill’s. Looking for a good book? In The Paper Magician, author Charlie N. Holmberg has created a believable and thrilling fantasy that is fun and fantastic to read.